At Cloud Design Box, we have created a free Google search box SPFx web part. 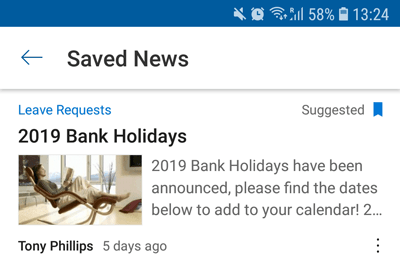 It’s a very simple web part to add a Google search box to a modern SharePoint page which then opens up the results in a new tab. Maybe a nice web part for an intranet homepage? You can download it here or even submit code to the project! A big thanks to Lloyd for writing most of the code to get this to work and for sharing on GitHub! I’m sure we can develop this over time to make it even more useful. There are web part properties to change the search results url, you can use your local Google search page. In addition to this you can change the default search text and search button text! Enjoy! This entry was posted in GitHub, Google, Modern Experience, Office 365, SharePoint Framework, SharePoint News, SharePoint Online, SPFX, Tony Phillips and tagged Community, Free Download, Google, Google Search, Google Search Web Part, Office 365, SharePoint Framework, SPFX, Web Part on February 2, 2019 by Tony Phillips. Smooth, frictionless user adoption can be tricky. You’ve decided that Office 365 and SharePoint is right for you. But, there’s the small matter of convincing the rest of your team and getting everyone in your organisation on board. We’re creating a series of podcasts focusing on real-life user adoption stories, with schools, academies and businesses just like yours. Our aim is to share and encourage a community resource that will help others who may be struggling with user adoption. The first episode of this podcast features Tony Phillips, Cloud Design Box Founder, Darren Hemming, our Operations Manager, and Martin Byford-Rew who is the Head of ICT Services at Thomas Deacon Education Trust. Martin outlines the key challenges he faced when starting to move across to Office 365 and SharePoint, as well as giving some excellent actionable tips on how to roll out the suite across a school, academy or business. “Our overall vision has been the same throughout the whole process – to move over to the cloud and get everyone to see the value in Office 365 and SharePoint,” Martin tells us. “We started user adoption from the very top – the board. 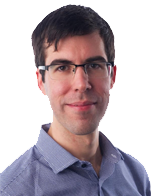 This involved a very short, concise training session with board members to show them the basic building blocks of Office 365 and SharePoint,” Martin explains. From there, the ICT team worked their way down the school structure, introducing the technology to each level of the school. 2. Take small, simple steps. “It’s all about small, quick wins. Teach the ‘ABC’ steps of Office 365 and what you can do with it, instead of overwhelming people with the vast number of features that may not even be useful for them,” he continues. Martin accomplished this by organising short, 10-minute sessions where he encouraged staff to log in, create and save a file and then share it with a colleague. “There’s no point in presenting a solution to a problem that doesn’t exist. Get to know how your staff work, get to know what their pain points are and offer a resolution from there,” Martin highlights. By tailoring your training to individuals or small groups of people with a similar job role, you can really get them to understand how the product can help them save time. 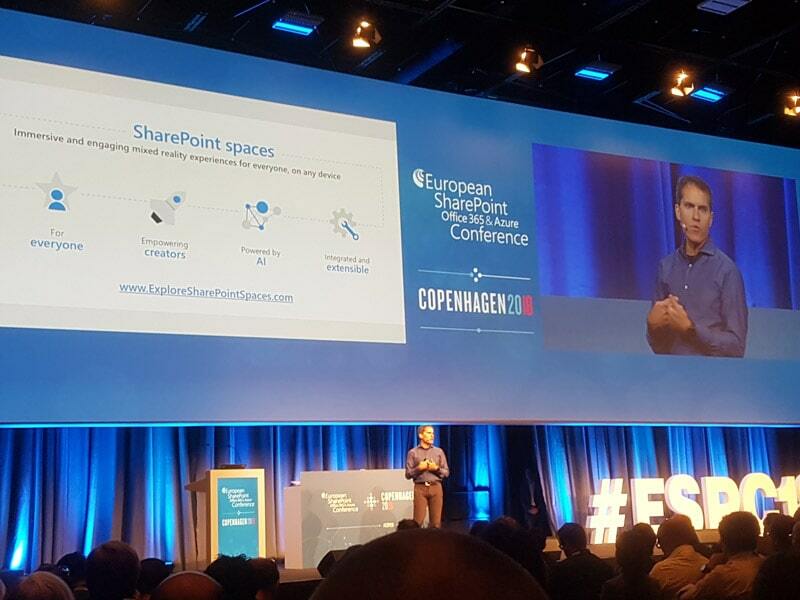 Finally, Martin gives some real-life examples of where he has rolled out Office 365 and SharePoint. Previously, parents would fill out a paper slip, which would then have to be processed and sorted by admin staff. It was a slow process and many parents would forget to complete the forms. Now, teachers approach parents with an iPad that has four or five questions on. It’s instant feedback and doesn’t require as much time from the admin team. A similar example of how Office 365 and SharePoint has transformed pupils’ learning experiences is with end-of-the-week quizzes. Again, this was once a paper-based exercise that was time-consuming and unengaging. 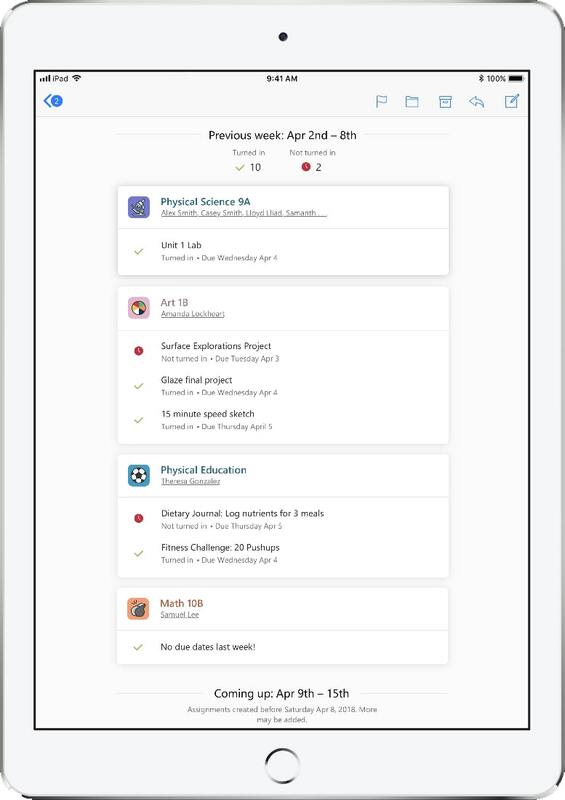 Students now answer questions on an iPad or other device and can see their results straight away, as well as compare their progress to their fellow classmates. It gives them an opportunity to take control of their own learning, as well as providing the teacher with insight into how well their class understood the lesson. Keep training short and concise. Leadership first and work down. This entry was posted in Assignments, Class Notebook, Education News, Microsoft Classroom, Microsoft Teams for Education, Office 365, SharePoint in Education, SharePoint News, SharePoint Online, Teacher Guide, Tony Phillips, User Adoption, User Adoption in Education and tagged Academy, Assignments, Bromcom, Capita, Class Teams, Classes, CMIS, Education, Multi-Academy Trust, Office 365, Pass, Podcast, Progresso, Pupils, Schools, Senior Leader, SharePoint, SIMS, SIMS.net, Students, Teacher, Teams, Teams for Education, Trust, User Adoption, User Adoption in Education on February 1, 2019 by Tony Phillips. It’s the update that schools have been waiting for. Today Microsoft announced parental access to Microsoft Teams assignments through a regular email digest. This update enables the school to emphasise the importance of homework and provide parents with all the information they need to fully support their children at home. I expect that the teacher will need to enable this option in each class (so that parents don’t get empty updates or lack of content). School Data Sync (SDS) will now support student contacts as a new CSV upload file. If you manage SDS yourself, this means there will be a new CSV to create and upload. Third party SDS sync providers will soon be able to support this. Parental contacts are optional so no need to rush and upload these. It might be worth waiting a few months to test this before rolling out to all classes and parents (it will give Microsoft time to fix any bugs) and it will give the school chance to cleanse parental data in the school MIS. You can find out more about how we can enhance Office 365 so that it’s really easy for teachers and students to navigate and use. We also focus on user adoption by providing training needs analysis, onsite training workshops and tailored roll-out plans to increase user engagement and get your school off to a flying start. Visit the Cloud Design Box website to find out more. This entry was posted in Assignments, Class Notebook, Education News, Microsoft Classroom, Microsoft Teams, Microsoft Teams for Education, Modern Experience, Office 365, School Data Sync, SharePoint in Education, SharePoint Online, SharePoint Online Permissions, Teacher Guide, Tony Phillips and tagged Bromcom, Carers, Cloud Design Box, College, Digest, Email, Email Digest, Guardians, iSAMS, MAT, Microsoft Teams, MIS, MS Teams, Multi-Academy Trusts, Office 365, Office Online, Office365, Parental Access, Parental Email Digest, Parents, Phillips, Progresso, Pupils, School Data Sync, School MIS, Schools, SDS, SharePoint, SharePoint Consultancy, SharePoint Design, SharePoint Online, SIMS, Students, Teams, Tony Phillips, Tony Phillips SharePoint, Trusts, UK on January 25, 2019 by Tony Phillips. 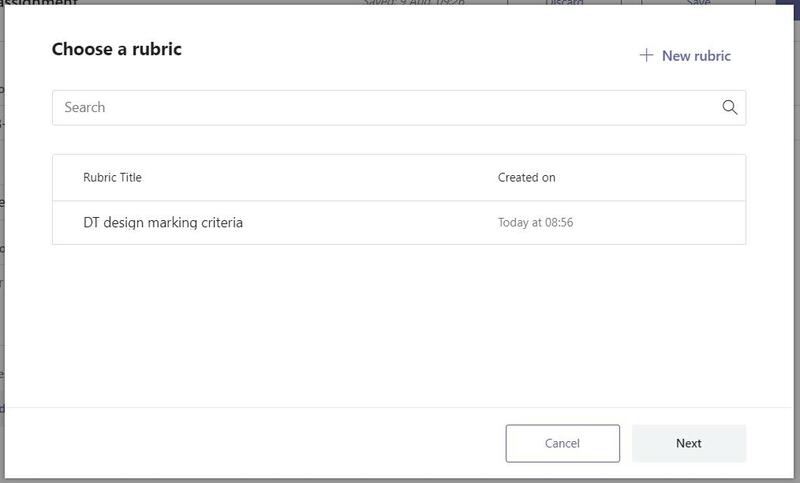 Microsoft Forms quizzes can now be assigned to students in Microsoft Teams for education. These are auto-marked and the results are fed automatically into the teachers markbook. Find out how to use this new functionality in the video below. You can find out more about how we can integrate Microsoft Teams, SharePoint and Class Notebook into an easy-to-navigate class dashboard by visiting the Cloud Design Box website. This entry was posted in Assignments, Education News, Microsoft Classroom, Microsoft Teams, Microsoft Teams for Education, School Data Sync, SharePoint in Education, Teacher Guide, Tony Phillips and tagged Assignments, Classroom, Education, Learning, Learning Environment, Microsoft Forms, Microsoft Teams, Office 365, Parental Portal, Quiz, Self marking, SharePoint, Teaching, Video, Virtual Learning Environment, VLE on October 26, 2018 by Tony Phillips. 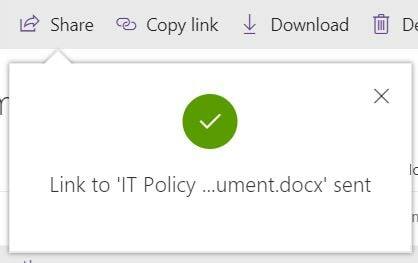 Sharing a document via SharePoint has many advantages. Traditional ways of sharing a document (such as emailing) creates many problems such as having multiple versions, removing central governance, it can cause confusion and inefficiency in any organisation. 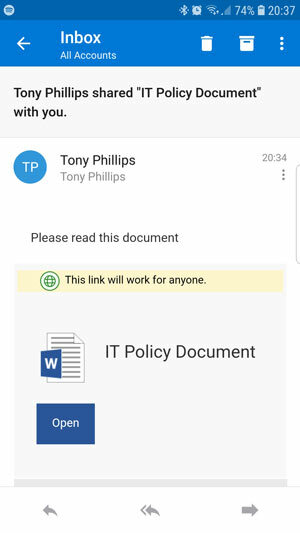 Sharing a document via SharePoint ensures there will only be one version of the truth, it keeps the document within your governance rules and provides ownership of the document to the organisation rather than the individual. There are benefits to sharing your documents for GDPR compliance too. 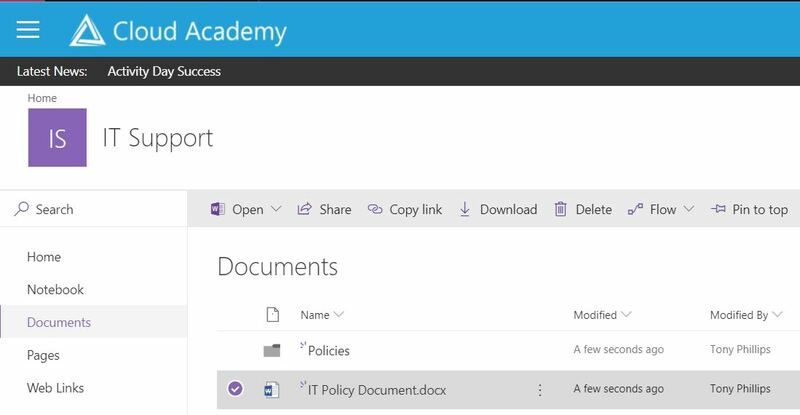 Keeping documents in SharePoint (even when collaborating with third parties) means that the document will still adhere to your retention policies and ownership. It’s much easier to stop sharing a document than retract an email (accidental data breaches). While in SharePoint there is a clear audit trail (containing any data breaches). 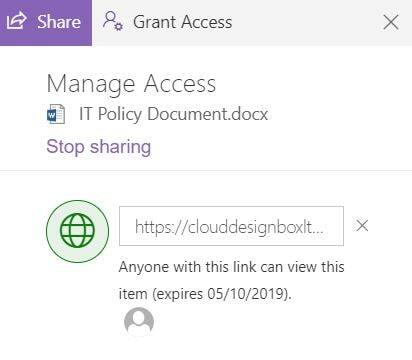 In this blog post I’m going to look at how to share (and stop sharing) a document in SharePoint. Start off by selecting the document and clicking “Share”. Enter the email address of the person who you wish to share it with. Users in your organisation will autocomplete as you type. Specific people – external users will receive a link and then a pin number to access the file. This stops users forwarding or losing the link. You can also allow users to have “edit” or just read access to the file. 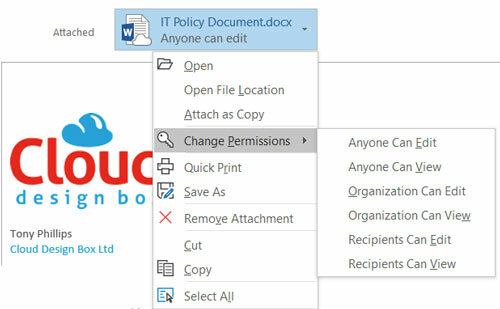 The document can be shared exactly the same way but through the outlook interface when attaching a recent file. “Share Link” will setup the default share link. 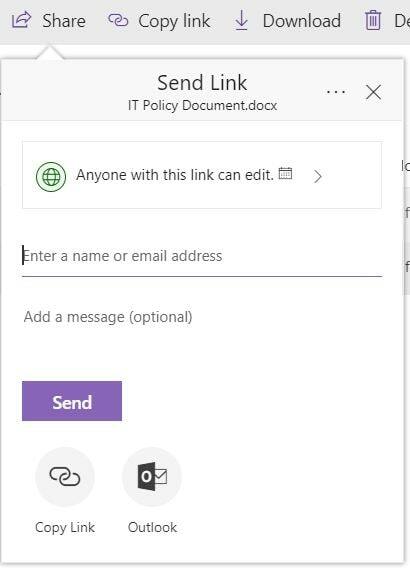 The permissions and link type can be set directly in Outlook before sending the message. If you are wondering what the email looks like to an external user, this is a screenshot from my non-Office 365 email share. 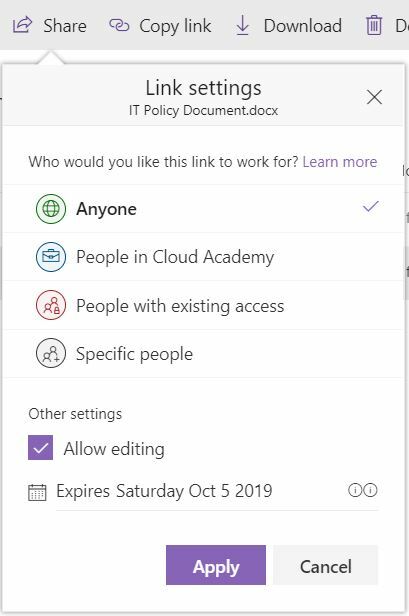 Maybe a document no longer needs collaboration, or you need to remove access for other reasons, you can do that very easily in SharePoint. Select the document and open the information panel if it’s not visible. It indicates that the item has been shared with guests. Click “Manage access”. You can stop sharing the document completely (as you might have a few links here if you have shared on different occasions with different links). Alternatively, you can stop sharing one of the links by pressing the “X” next to it. Confirm the link removal. If you want to share it again, you will need to send out a new link. 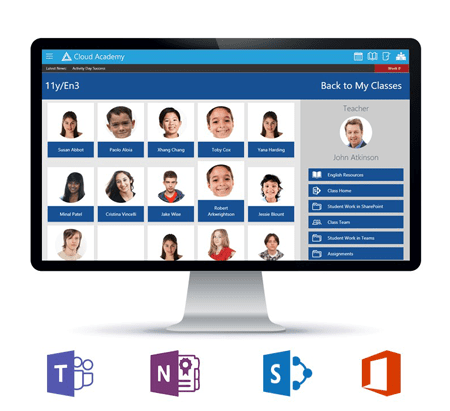 If you are interested in setting up SharePoint for your organisation or school, take a look at our easy-to-use pre-built intranet solutions specialised for business and education at Cloud Design Box https://www.clouddesignbox.co.uk. This entry was posted in Business, Education News, Microsoft Teams, Microsoft Teams for Education, Office 365, OneDrive, OneDrive for business, SharePoint in Education, SharePoint News, SharePoint Online, SharePoint Online Permissions, Teacher Guide, Tony Phillips, Website News and tagged Cloud Design Box, derby.hull, Email, external sharing, intranet, Intranet In a Box, links, London, Office 365, Outlook, policy, retention, SharePoint, Sharing, Tony Phillips on October 5, 2018 by Tony Phillips. Rubrics are a powerful tool used to assess students’ work. The criterion helps students to have a concrete understanding and visualisation of what they need to do to achieve a particular score. Each criterion also includes a gradation scale of quality. 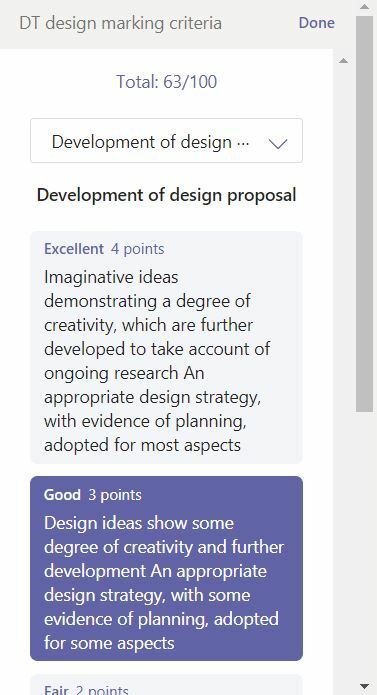 Microsoft Teams for education now includes rubric based grading. They can be created and reused across Teams making it a powerful time saving tool for teachers while at the same time helping students understand how to succeed in the assignment. If you are unfamiliar with Microsoft Team Assignments, please check out our earlier post here. When setting assignments, you will notice a new “Add Rubric” option. On this page, you can search for a rubric that has already been created at your school or create a brand new one. In this post, I’m going to go through how to create a new one. Click “new rubric”. Give the rubric a name and turn on “points” so that we can assign scores to each piece of criteria. Enter your criteria, you can add more by pressing the plus button. You can also adjust the grading balance for each element. Teams will turn the points into an overall percentage when marking based on the balance given to each criterion. When you have finished creating your rubric, set the assignment for the students. When the students have completed the assignment, go to review the work and open the student’s homework. In addition to the comment and grade, you can now select the rubric. This will show the criteria and you can select which has been met. The student work will be automatically marked based on the grade balance set in the rubric. This is what the student will see when you have graded their work with the rubric. It’s another fantastic update to Microsoft Teams for education. There is still more to come this summer including Microsoft Forms integration with self-marking quizzes. We will bring you news and guides on how to use that as soon as it is released! This entry was posted in Assignments, Education News, Microsoft Classroom, Microsoft Teams, Microsoft Teams for Education, Office 365, School Data Sync, SharePoint in Education, Teacher Guide, Tony Phillips and tagged Assessment, Classroom, Cloud Design Box, College, Derby, Derbyshire, Education, Hull, Marking, Marking work, Marking work in Teams, Microsoft Teams, Nottingham, Office 365, Office365, Pupils, Rubric, Rubric Criteria, Rubric Grading, Rubric Grading Criteria in Microsoft Teams Assignments, Schools, Students, Teachers, Teaching with Teams, Teams, Teams for Education, Tony is here, Tony Phillips, Tony Phillips Hull, Tony Phillips SharePoint, Video on August 9, 2018 by Tony Phillips.